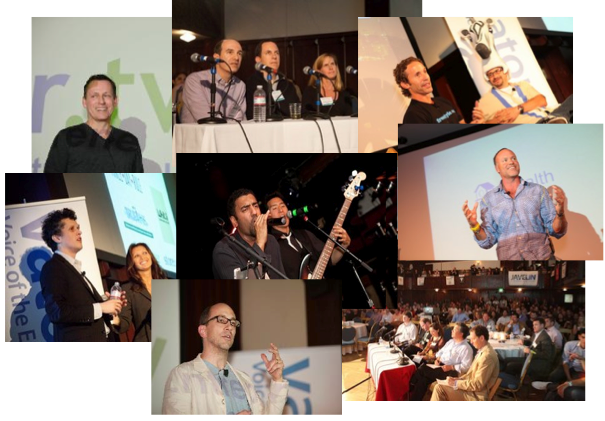 Like other Splash events and competitions, CEOs and/or founders of 10 companies, chosen by their peers and vetted by judges, will have the opportunity to present onstage and give a three-minute presentation in front of some 400 business professionals, comprising of executives from startups and large companies, angel investors, VCs, and media. Vator will hold its bi-annual SF Splash event at Cafe du Nord in San Francisco, on the evening of September 27. To be among the top 10 promising start-up presenters, you must apply by joining this competition. Even though success is not defined by how much money a company has raised, Thumbtack, Getable, Grovo, Astrid, Udemy, and Geeklist have gone on to raise millions of dollars collectively from venerable VCs, soon after presenting at Splash. - The opportunity to give a three-minute presentation onstage. At the night of the event, the judges will choose the overall Splash winner. The audience will choose the People's Choice winner. All participants who enter this round will automatically move into the next round. Round 1 is merely to open up the competition and accept applications before the popular voting round starts. Is the market a big macro opportunity? Is there a prototype and has it already received some initial traction? Did the team indicate clearly their go-to-market strategy to attract users? Did the team clearly articulate their business model? Did they demonstrate how they will compete effectively? Is this business a venture-backed opportunity or a life-style business? Does the team have the talent, expertise and drive necessary? Is the team relevant to the opportunity? Does the team have the expertise to succeed? Is the team clear about the objectives? Can the team convey the opportunity? Judges are encouraged to vote and rate each participant. Each judge has their own style of rating and voting. Some prefer to look at PPTs; some prefer to just look at the company profile; some check out the participant's website. Vator encourages judges to look at all material provided. But Vator organizers cannot force a judge to look at all submitted material. Nor can organizers force a judge to provide feedback, though it's strongly encouraged. Judges are asked to only judge 15 start-ups. So, if there are 18 or 20 in this round, judges can ignore three or five start-ups. They're asked to only look at their favorite 15. Patrick Dietzen is Managing Partner at VC group DoubleRock & is VP Business Development at Cydia. He has 10+ years tech venture experience including founding Sirigen (sold to BD) & is a UCSB alumnus. Co-founder and CEO of Sweep (acq. Affirm). Previously VP of BD and Corp Dev at Pandora. Former VC Associate/Analyst. Bryan Goldberg is a founder at Bleacher Report, one of the largest digital sports media companies. He has deep experience in both Product and Sales. Time Warner acquired his company in August 2012. Xander Mahony is an Investment Professional at Draper Fisher Jurvetson, focusing on technology investments across sectors. Prior to joining DFJ, Xander was an analyst at Sloane Robinson, a global emerging market hedge fund based in London. At Sloane Robinson, Xander concentrated mainly on China and India, and also the technology, transportation, telecoms and luxury goods sectors. Prior to working in finance, Xander started three companies, including an online music service with a proprietary algorithm for personalizing the price of digital music. Xander has a BA in Computer Science from Oxford University and has completed Level III of the CFA program. Experience: Apple, Preview Systems, eBay, LinkedIn. Education: BS/MS Computer Science @ Stanford, MBA @ Harvard. Partner at Inventus Capital. Seek to support entrepreneurs, particularly those building disruptive digital services businesses. Andrew leads Grant Thornton’s Bay Area Valuation Practice and provides a range of services to entrepreneurial and venture backed companies, including both those that are raising their Seed round and those that are ready for an IPO or sale. His team addresses valuation, capital structure, compensation, and operational issues including compliance with tax and financial reporting requirements. They work with companies across the technology spectrum, including social networking, cloud computing, software, and hardware. They also have developed a focus in CleanTech. Prior to Grant Thornton, Andrew had similar roles with Huron Consulting Group, Sutter Securities, and KPMG. He also took a turn as a start-up CFO at MagnetPoint, an early stage communications software company and has lead family office investments, including ChartWare, an electronic medical records star-up. In a prior career he worked in construction management where he helped build tangible things, including the Santa Clara County Jail (which he hopes is relatively unknown to the Vator community). Andrew received a BS in Structural/Civil Engineering from UC Berkeley with a minor in Architecture and a very minor minor in Crew (Cal 155). He attended UCLA’s Anderson School where he received an MBA in finance and considered a career in the film industry until he saw the movie “Swimming with Sharks” at which point he returned to the relative calm of the Bay Area. Rich represents emerging growth companies and venture capital/private equity investors, in areas including venture financings, M&As, public offerings, strategic alliances, and corporate governance. Wes is Managing Director of Better Ventures, a venture firm that backs early-stage technology companies creating innovative solutions to big and important problems. Jeff is the CEO and co-founder of Smule. Smule, developer of I Am T-Pain, Ocarina, Glee, and Magic Fiddle for the iPhone/iPad, is building the new sonic network one application at a time. Smule has over 9M customers. In addition to Smule, Jeff is currently pursuing a PhD in Computer Music at Stanford University. He previously received a BS in Computer Science at Stanford University. In between Stanford and Stanford, Jeff co-founded and ran an email security software company which he took public on the Nasdaq and grew to $50M in sales before stepping down as CEO in '05. Jeff co-founded Simplify Media in '06, which Google acquired in March of '10. Jeff is the co-author of sixteen patents in the field of email security.